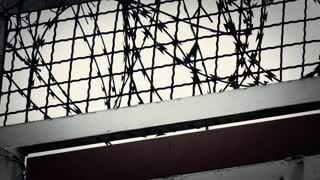 Search Results for "barb wire"
Husband and wife ranchers repair woven wire farm fence, twisting wire around barb wire, West, Texas, 60 fps, 4K. Slow motion view through the fence at ranchers repairing a woven wire farm fence, twisting wire around barb wire, West, Texas, 23.98 fps, 4K. Slow motion shot of husband and wife ranchers repair woven wire farm fence, twisting wire around barb wire, West, Texas, 23.98 fps, 4K. Slow motion shot of husband and wife ranchers repair farm fence, twisting wire around barb wire, West, Texas, 23.98 fps, 4K. Slow motion view of husband and wife ranchers repair farm fence, twisting wire around barb wire, West, Texas, 29.97 fps, 4K. Female farmer repairing a barb wire fence on the ranch with scenic backdrop of Davis Mountains in West, Texas, 29.97 fps, 4K. Slow motion shot of rancher and wife repairing a barb wire post fence together on their farm in West, Texas, 29.97 fps, 4K. Slow motion looking over a barb wire fence of a man and woman making repairs around the cedar posts in West, Texas, 29.97 fps, 4K. Slow motion shot of female farmer repairing a barb wire fence on the ranch with scenic backdrop of Davis Mountains in West, Texas, 23.98 fps, 4K. panning view of a bean field farm through a barb wire fence. A tilt up shot of a wide landscapes of Ireland. A barb wire on a foreground. 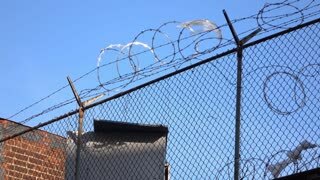 Exterior of gated place with metal fence, barb wire and security cameras. Wind blows trees and blue sky shines. Broken fence vintage girl shadow body. The silhouette body of a young woman appears as a shadow behind a white fabric screen. Seen through a fence with barb-wire.